I once read cocktail bitters described as the salt and pepper of cocktails. Just like cooks that learn to season their food for better results, bitters can add a final interesting touch to a drink that pulls it all together. Sure, you can make drinks without them, but once you start using them, you'll definitely up your cocktail game. All this week I'm focusing on cocktail bitters, those strange little bottles you may see at the grocery or liquor store often near the tonic water, grenade and cocktail onions. If you've ever wondered where they come from and how to use them, I hope to provide some fundamentals this week. Today I'll explore the basics and history of bitters and share recipes for Manhattan cocktail, made with Angostura bitters, and the Sazerac cocktail, made with Peychaud's bitters. Tuesday, I look at drinks with modern bitters (G&T Martini, Smoky Paloma, The Gold Baron and Improved Tequila Cocktail). Thursday, I'll share how the modern cocktail renaissance allows us to experience old-fashioned cocktails in a new way (Fancy Gin Cocktail and, you guessed it, the Old-Fashioned). And Friday, I'll use bitters in a non-cocktail application (Angostura bitters chicken salad). Cocktail bitters are high in alcohol but generally considered non-potable, which is why you can find them in grocery stores that don't sell liquor (like vanilla extract, for example). The New Food Lover's Companion describes bitters as "made from the distillation of aromatic herbs, barks, flowers, seeds and plants..." Sounds a bit medicinal, doesn't it? That's exactly where bitters originated. Brad Thomas Parsons writes in Bitters (an indispensable resource for this week's series that I'll discuss at length later) that sometime during the 18th Century, bitters drinkers began mixing them with alcoholic beverages, possibly in an attempt to make them taste better. Thus began their symbiotic relationship. Through time, this combination became more alcohol and less bitters until we come to the 19th Century, the first "golden age" of American cocktails, where bitters were commonly mixed with drinks. Parsons writes that by the 1850s there were hundreds of bitters available in the U.S., many of which were still marketing questionable health claims--a practice curtailed by the Pure Food and Drug Act of 1906. "After one year from the ratification of this article the manufacture, sale, or transportation of intoxicating liquors within, the importation thereof into, or the exportation thereof from the United States and all the territory subject to the jurisdiction thereof for beverage purposes is hereby prohibited." - 18th Amendment (Section 1) to the United States Constitution, 1919. With those words, the American art of cocktail making entered a dark period (not a completely dormant period though, hence the speakeasy). This had a deleterious effect on the bitters industry, which all but dried up. According to Parsons, only Angostura, Peychaud's and some varieties of orange bitters survived prohibition, and Angostura and Peychaud's were the only major brands available until Fee Brothers came out with orange and aromatic bitters in the 1950s. Of course, even if there were more types of bitters available, would they have been put to good use? Consider that the latter half of the 20th Century was a time when popular cocktails were made with ingredients like excessive amounts of heavy cream, sweet and sour mix and other sickly sweet mixes. With this century's renewed interest in the craft of cocktails, bitters are back in a big way. In addition to the familiar names that are still available, some of the old-timey bitters that vanished have been brought back. In fact, in 2007 when David Wondrich published Imbibe! (another indispensable resource), he included recipes for three types of bitters that could not be purchased at the time: Jerry Thomas's bitters, Stoughton's bitters and Boker's bitters--all of which are now available (or at least as modern approximations). Additionally, there are quite a few companies making new and interesting bitters. 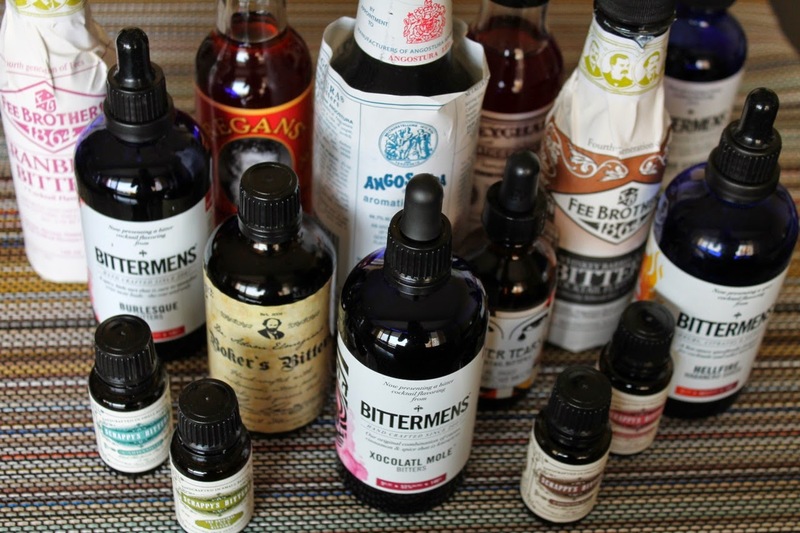 One of my favorites is Bittermens, a company founded by a couple (Avery and Janet Glasser) in 2007 making mole bitters that has since expanded to a full line of bitters and other extracts. Seattle-based Scrappy's is another good one, that sells their bitters in trial-size 4-packs, a great way to introduce yourself to some interesting new bitters. As you can see in the photo at the top, I amassed quite a collection of bitters researching this week's drinks and look forward to telling you all about them. If you try any of the drinks or use the bitters in a different creation, please let me know. Cocktail recipes use different terms when referring to adding bitters. The most common is the "dash," which is meant to be a squirt from the bottle, since many bitters bottles are designed for this, although increasingly I'm seeing bitters bottled with droppers. So how much is a dash? Kevin Liu addressed this in his book, Craft Cocktails at Home, which includes a transcript of a Twitter chat in which Parsons says a dash is 5 drops. However, Liu's analysis shows that different bitters bottles "dash" different amounts, so this isn't an exact measurement. I'll often add an extra dash, especially if the first one doesn't feel like a "full" dash. The bottom line is that it's a matter of taste, so add more or less as desired. Despite being "non-potable," you can drink bitters. Despite their name, they aren't just bitter, more bittersweet. But they are strong. Liu also has a good discussion about this on his blog. He advocates taking them as shots, but acknowledges you can also mix them with seltzer. I tried a little of both and will discuss their flavors along with cocktails you can make with them. Bitters: A Spirited History of a Classic Cure-All with Cocktails, Recipes & Formulas by Brad Thomas Parsons (2011). Parsons' book on bitters is simply phenomenal. I learned a lot while reading it, and much of what I have to say this week is influenced by this great book. If you're interested in bitters and their place in cocktail history, I definitely recommend this book. In addition to containing a lot of bitters-based cocktail recipes, both classic and modern, he also includes recipes for making bitters--something I considered trying but ultimately took a pass on. Bitters won the 2012 James Beard Book Award for beverage writing. Imbibe! : From Absinthe Cocktail to Whiskey Smash, a Salute in Stories and Drinks to "Professor" Jerry Thomas, Pioneer of the American Bar by David Wondrich (2007). Because bitters are so closely linked to the early days of American cocktail-making, Wondrich's book also proved to be an invaluable resource for my classic bitters cocktail posts. Imbibe! focuses on Jerry Thomas, a 19th Century bartender Pete Wells once called "the father of American mixology" for his pioneering work in developing and documenting the craft of cocktail-making. Imbibe! also won a James Beard Award. The Craft of the Cocktail by Dale DeGroff (2002). 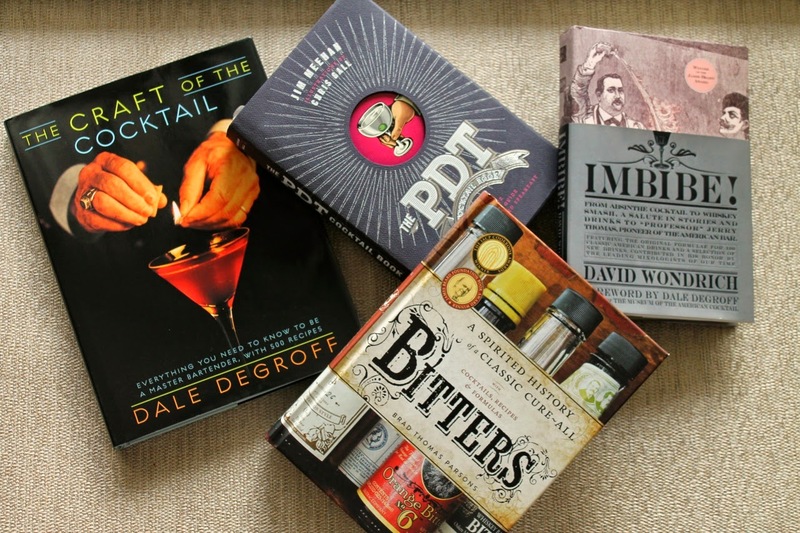 DeGroff's book is an all-around good cocktail resource that also includes a great historical discussion up-front with more breadth (it goes up to the more-or-less present) and less depth than you get in Imbibe!, which focuses on the early days of cocktails. The PDT Cocktail Book: The Complete Bartender's Guide from the Celebrated Speakeasy by Jim Meehan (2011). I could recommend The PDT Cocktail Book as a good resource for any number of cocktail-related topics, but it's particularly suited to bitters since many of its recipes include them. Craft Cocktails at Home by Kevin Liu (2013). I wrote about this book last year and, although I didn't refer to it much for this project, it's still a good read and includes a chapter on bitters that covers a range of interesting aspects about them, including taste and recipes. This is an ambitious project. I admire you for taking it on. I also presume I've tasted the mole bitters you mentioned. Did I like whatever drink you made with them?